About 1,5 year back we send an e-mail to the Amsterdam based architecture firm Concrete. We love their work and were eager to get in touch with them because we believed our WasteBasedBricks would be a great fit with their projects. We presented our selection of sustainable bricks and a few months later they called us: ‘we’re working on an ambitious and large scale project in New York and we think the Truffle RAW would give the facade the perfect look and feel’. What followed was a year of closely working together to further develop the Truffle Raw into a brick with the right colour and texture for this project on 11th avenue in Manhattan. The building, that’s under construction now, is a new residential development at 646 Eleventh Avenue and will become the largest condo offering on Hell's Kitchen's Eleventh Avenue (aka "Auto Row"). The full block-front project replaces a low-slung Lexus dealership and is to bring a 12-story condo with an auto showroom at its ground floor. Construction started early this year and will be completed spring 2020. The building is developed by SK Development together with Ironstate. Construction is done by CMA. At the moment, production is in full swing. No less than 42 different sizes and shapes of the Truffle Raw are being made at the moment to fully cover each corner and curve of the facade with the shiny grey / silver look. Keep an eye on this page for more photo’s. Can we use your products for flooring as well? That was the question of Studio Rian Knop when they approached us. They were working on the new interior of a leading tech company based in Amsterdam. We did have a bit of experience with the WasteBasedBrick used as flooring but not yet on this scale, and not yet for a client that is quickly becoming an impactful worldwide player in their field. 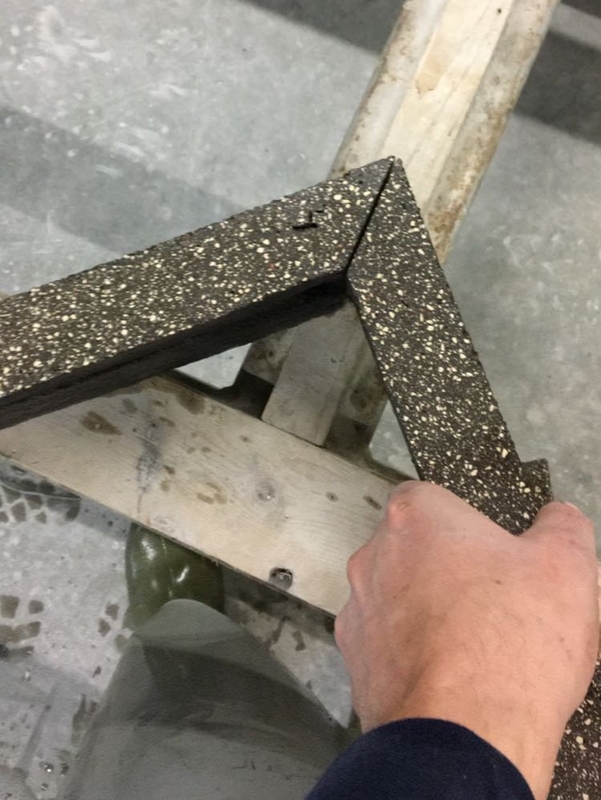 After running additional tests to make sure the product would perform well in the new office, we sent the bricks to the ‘floorman’ who cut the bricks into thin slices of BlackPepper. We used a size of 210*50*15mm for this project. Approximately 3750 kilo waste was upcycled in this project and hundreds of people enjoy their lunch on it every day. Take a look at the photos (credit: Phenster) below. What do you think? As Europe’s leading importer and distributor of organic fruit and vegetables, after years of continuous growth, Nature & More (also known as Eosta) was in dire need of more space. Preparations for the design and construction of a new building commenced a few years ago. The resulting building exudes warmth and humanity and may be considered the physical expression of the company’s core values of Authenticity, Togetherness and Social Responsibility. The building has many circular and sustainable characteristics. Both the shell and design have a materials passport, which states the materials used to ensure they can be reused as much as possible after demolition. StoneCycling provided the sustainable wall cladding for the interior: a special Long & Lean Mushroom brick slip. Check out the photos and how it’s made below. The designers of Ex Interiors approached us to work with them on a waste based concept for the wall cladding of this sustainable office. Together we selected the Mushroom as the starting point for this special project. We changed the recipe slightly to create a gradient of Mushroom WasteBasedBricks. Additionally Ex Interiors challenged us to create the longest WasteBasedBrick so far. With its 45cm length and different finishes (Raw, Punched and Sliced) we were able to contribute to a lively and warm sustainable interior. In order to create a color and texture nuance we came up with the idea to use one brick, the Mushroom, and create three types of finishes on it: Raw, Punched and Sliced. In this way we were able to create an efficient production process. Additionally the brick bond allowed the masons to use every little bit of the Mushroom, creating almost no new waste during the construction process. Queen Maxima opened the office officially last november together with CEO Volkert Engelsman. 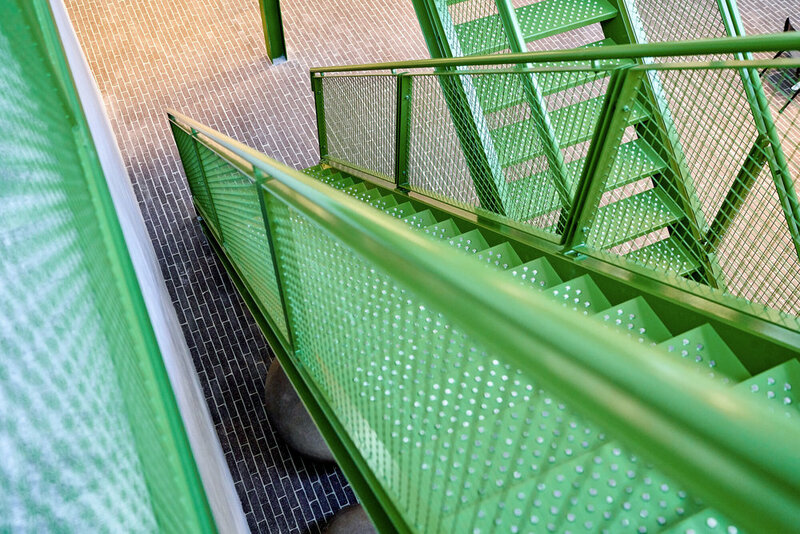 We are extremely proud to be part of such an ambitious project together with one of the leading specialist in circular and sustainable building Logge Circulair and the architects of Ex Interiors. Together we managed to upcycle 4600 kilo of waste that would otherwise end up in landfills. Our WasteBasedBricks carry names such as Truffle, Aubergine and Caramel. Often people ask us if they are made of food waste. This is not the case (otherwise they wouldn’t laste many decades) but we are excited when our materials get applied in interiors and exteriors that tickle our senses. One of our clients did exactly this. Starbucks is working dedicated to make their shops more circular by applying sustainable materials. The focus of StoneCycling on both sustainability and design has proven to be a perfect match. After a long process the first few Starbucks outlets with StoneCycling WasteBasedBricks are a fact! BlackPepper, Caramel and Nougat bars and coffee-to-go counters can now be seen in the UK and Romania. Hopefully many more will follow. Below a few photo’s of the projects. When Starbucks does something, they like to do it good. About two years ago we met their head of design at the Dutch Design Week. A few weeks later we visited their office in Amsterdam to show the range of colours and textures of the WasteBasedBricks. They immediately started working on concepts and designs, got us linked with their quality team in London and challenged us to look at our products in a different way. This resulted in the first few mock-ups featuring our Aubergine, Nougat and Caramel in various Raw and Sliced mixes. Working with the designers of Starbucks led to surprising insights for us. By using different levels of ‘thickness’ and combining the Raw and Sliced finishes, a totally new aesthetic was created. This helped us to further explore the things we can do with our products. The design team was specifically looking for a material that could both be applied inside and outside. After many reviews, quality checks, factory visits and coffees we finally finished the first three projects for Starbucks’ Drive Thru concept. In this concept, our material is used for the coffee bar inside and then extended to the drive-thru counter outside. This colourful condo in Amsterdam is almost finished. We're are so excited about the wide range of WasteBasedBricks applied in this facade that we couldn't wait sharing it with you. The architects of Urban Echoes came up with a unique pattern of ten different 'tastes' of WasteBasedBricks which were applied by construction company Vink Bouw. They created a mixture of the Wasabi Raw & Sliced, Nougat Raw & Sliced, Truffle Raw & Sliced, Caramel Raw & Sliced, and Mushroom Raw & Sliced. Here's a few snapshots to give you an idea. They project will be fully ready after the summer. Expect wide-angle photo's by then.